The first of our open meetings to discuss the Wood Green Literary Festival, which we are organising this year, was a big success. We had a great group of people turn up who put forward some great suggestions & ideas for us to think about. The second of these meetings is on Tuesday February 19th at the Bookshop. Everyone is welcome. The evening with Tracey Thorn on March 6th has sold out already. We are considering looking for a bigger venue, but we very much want it to stay LOCAL. If you have any suggestions of where might be a suitable venue, please get in touch. This being the case, we have started a reserve list, for people who would like tickets if more become available. We have just found out that Lauren Oliver, one of America’s biggest Young Adult authors, is coming to the UK in March for a couple of days. Naturally we got in touch with her publishers, and she is now going to be visiting one of the local schools with us. This is huge, by the way! Lauren will be with us on the morning of March 19th and she’s happy to sign and dedicate copies of her books for any of her UK fans. We can send these out anywhere in the UK with FREE P+P. Not only that, but she’ll be at the bookshop on the day, from 12.30-1pm to sign copies of her books too. More information can be found on our website, here. As ever, it's just a fiver to get in and you can bring your own refreshments. Here's an update for all the Independent shops that have been in touch since the thing I wrote about getting a better deal on E-Books and E-Readers. Essentially this was the point of the blogpost. We are a small bookshop in Wood Green. The e-book market is very competitive. 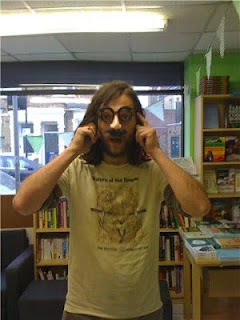 We want to have some of the market, but being a small bookshop in Wood Green, we don't get much of a say in the matter. But what if a big group of us like-minded Independent Bookshops got together and decided what was best for us. We could then approach E-Book suppliers, as a group of shops and see if we could negotiate something better. So far we've had 16 (maybe even 17) bookshops show an interest, which I think is a pretty good start. One of those bookshops suggested that it would be good to get a Private Facebook Group set up, so that we can chat and share our thoughts. So I have done. It's called "E-Books for Independents". Because it's private and because I set it up, this means that initially, I can only invite my Facebook Friends. (once you join, you can invite your own friends). So, this is a message to all the Bookshops who are interested in joining. I am Simon Key on Facebook and I look like this. I'm sure there's an easier way of doing this, but until I know it, this is the best we have. When you send the request, please mention E-Books, so I can add you to the group straight away. do you remember at the beginning of December, I wrote a blogpost letting you know that Haringey Council had accepted our proposal to put on a Literary Festival in Wood Green and awarded us £10,000 of their High Street Innovation Fund. The council have now sent us out remit and given us targets to achieve. 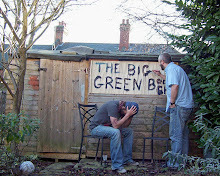 The Big Green Bookshop will develop partnerships to deliver a “Wood Green Literary Festival” that that will encourage footfall and promote the economic and cultural vitality of Wood Green Town Centre. The festival will run for three days and will be delivered at a range of venues around Wood Green that will showcase the local cultural and retail offer. Now we have the remit, we can now set up a couple of open meetings in which we are inviting anyone and everyone who wants to get involved with the Literary Festival to come along and offer help, opinions and ideas. The first of these meetings is going to be this Thursday February 7th, in the bookshop at 7.00pm. Don't get there too early as we have a film crew in the shop until about 6.45pm. We'll provide refreshments and i'll try and get someone from the Council along. If you can't make the meetings but want to be involved, NOW is the time to email the shop. (enquiries at biggreenbookshop dot com). At this stage we are just getting all the information together. Once we've gone through all your ideas etc, we'll then be able to add a little bit of structure to the festival. This is going to involve lots of hard work and if we're going to do this right we're going to need all the help and support we can get. The Festival has the potential to be one of the most exciting things to happen in Wood Green for years, and we hope as many peolpe and businesses in the area will help our dream become a reality.